Our goals in training are the development of the student’s body, mind and spirit as well as the improvement of self-defense skills. We train in a non-competitive environment where members endeavor to better their own practice and to help other members improve as well. 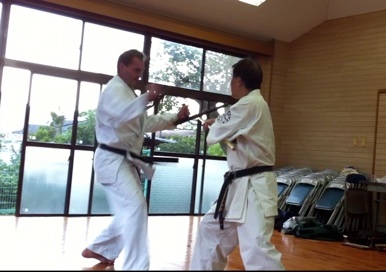 We offer instruction in traditional Okinawa Karate-do as well as Ryukyu Kobudo. Classes are open to students 19 years and older. Our goals in training are the development of the student’s body, mind, and spirit as well as the improvement of self-defense skills. Classes are 90 to 120 minutes long and consist of stretching, calisthenics, kata (forms), and paired practice using with the techniques found in classical kata. We do not participate in competitive events in or outside of the dojo. In the dojo, we aim to train hard, work together to develop our skills, and enjoy our training. If this interests you contact us. We train out of Hillcrest Community Centre (4575 Clancy Loranger Way, Vancouver, BC). As we age people think that starting a martial art is impossible. Still others who may have practiced Karate-do when they were younger think that they can’t continue as they get older. This is unfortunate as unlike sport Karate or Japanese Karate, Okinawan Karate-do and Kobudo can be practiced throughout a person’s life; well into her or his advanced years. If you live in Metro Vancouver and are interested in participating in a Karate-do class for adults, contact us and we will get you started on your journey. Our dojo is a very social place because there is no competition in Okinawa Karate-do or Ryukyu Kobudo. Members are genuinely friendly both in and outside the dojo. We hold social events such as pot lucks, Christmas party, New Years party, or after practice get-togethers, as well as attend or host the occasional seminar.